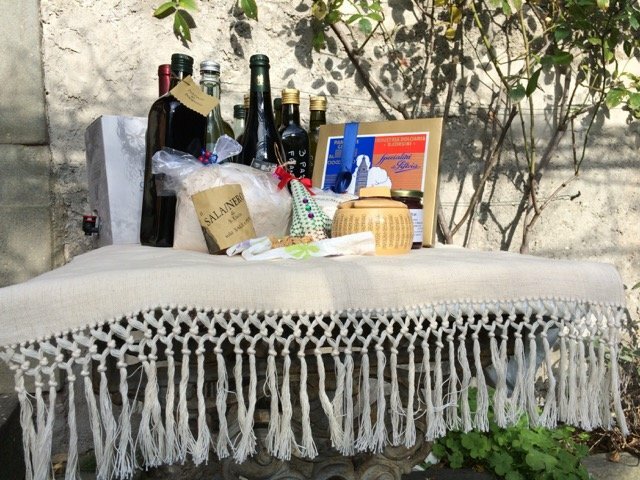 On 23 December as I looked over my menu for Christmas lunch, I was struck by the generosity of my Italian friends and producers. I realised I didn’t have to buy most of the ingredients I needed! They were gifts people had thrust upon me over the last two or three months, not just Christmas presents, but as part of their culture of giving. You share what you have, especially what you make yourself. The next morning I realised I’d forgotten at least half the gifts, and gathered some more. But notice the eggs here, because I forgot them later. The eggs came from Ida, the mother-in-law of Marzia, one of the cheesemakers to whom I take my tourist guests and participants on my cheese course to learn to make cheese and ricotta (find out more about her here). I’d gone to pick up (and pay for) the shoulder of lamb I was planning to roast on the 25th. I needed eggs too for the tortellini my friend Penny and I were going to make. When Ida calculated the bill, the eggs weren’t on it. They were her present to me, she insisted. 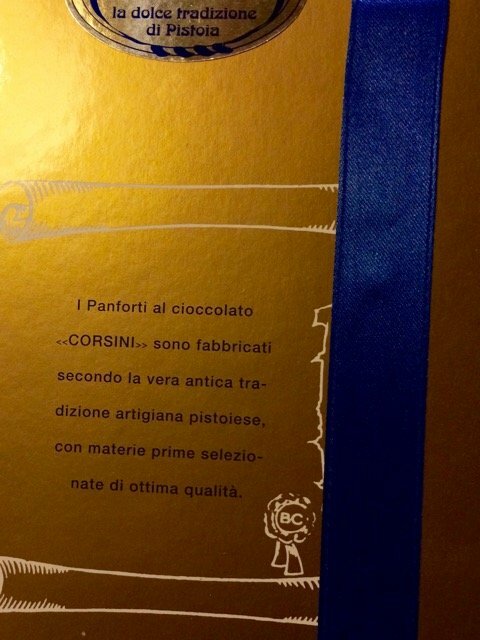 But also, there was a bag of precious chestnut flour tied with a blue ribbon and red berries. That was Marzia’s present, equal in value to the shoulder of lamb. She knows I consider hers the best and sweetest ever since my own village stopped producing it. I began contemplating lots of castagnaccio. The cloth on which the presents sit was given to me several years ago by Nada and Romeo Ricciardi. Handwoven by Romeo, it has a cotton warp and hand-spun hemp weft. Romeo ties the fringes while watching football on the telly. 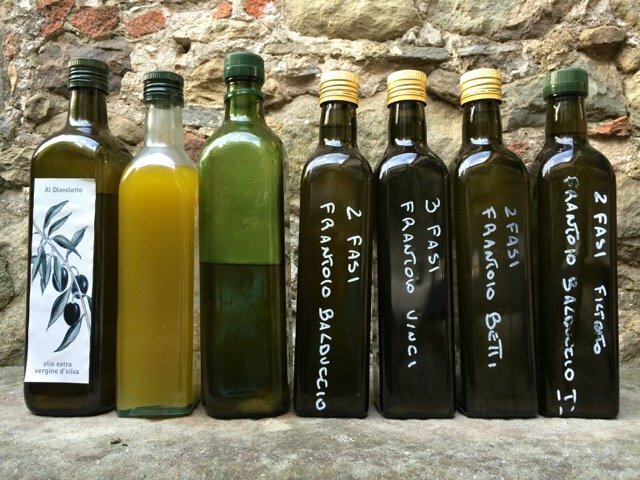 All seven oils come from friends who picked the olives by hand and took them to the olive mill. On the left, Al Diavoletto (at the little devil) from my friends the Wilkinson’s (architect and artist, hence the label); the murky yellow one from Marzio Paganelli my driver and his wife Carla (we have no idea why it looks like that); then a bottle from Claudio Orsi of Alle Camelie where I take clients to pick olives and see them pressed in Claudio’s private oil press; finally four oils from Elisabetta Sebastio who will be teaching my new olive oil courses and a day in my Autumn in Tuscany tour. On the left, a digestivo called nocino made by Maurizio, Elisabetta’s husband. No comparison between this and the commercial liquid you get (if you can find it). Next a bottle of grappa. I was trying to buy a bottle from Renato in the shop in my village. Instead of taking a bottle from the shelf, he disappeared round the back and returned with this bottle with an unpromising label. It was grappa made in the Garfagnana by a friend of his son. I tried to pay him, but lost the battle. Also from Renato and his wife Eugenia is the bottle of red wine, their annual Christmas present to their customers. 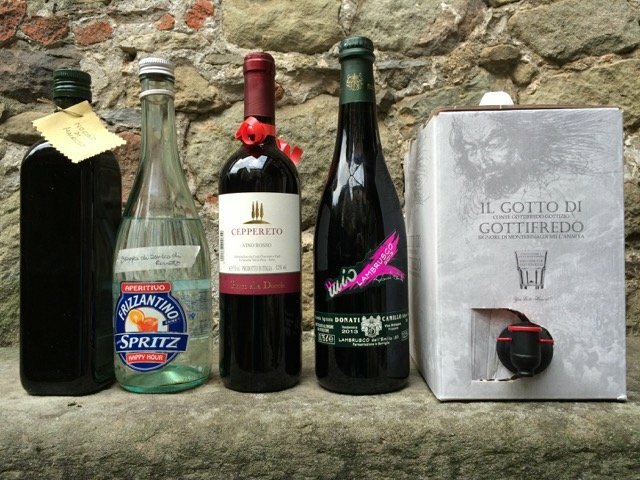 Next in the lineup is a surprise entry, a bottle of lambrusco, the typical wine of Parma and Modena. I’ve been exploring that territory with a view to creating a new tour (and salumi course) and have come to appreciate this light fizzy wine which goes especially well with the salumi and bollito misto of the region. It was thrust upon me by Aldo Brianti who rears the black pig of Parma and makes salumi with its meat (more about this below). He rates it the best lambrusco from Parma. The Gotto di Gottifredo sounds like a mediaeval Longobard landowner. Another present from my driver Marzio who often visits vineyards with his clients. A good bag-in-box is ideal for people like him and me who only drink a glass of wine a day with their evening meal. 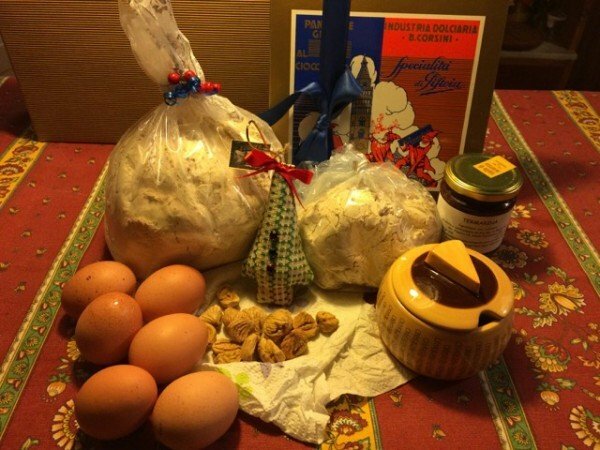 The smaller sack of chestnut flour came from Ferdinando, whose restaurant L’Aurora is below my village. I’d gone to buy eggs from his neighbour who wasn’t to be seen. Instead Ferdinando was pottering about and I took the opportunity to tell him I’d like to help with the chestnut harvest next year. His face lit up. He invited, nearly dragged, me into the kitchen to taste his chestnut flour and quickly spooned some into a bag for me. To prove how well he’d cleaned his chestnuts, he pulled some dried ones from the cupboard and wrapped them in some kitchen towel. Since I don’t often frequent his restaurant, his gesture must be one of pure pride in his work and a desire to share something good with others. The Christmas tree leaning on the chestnut flour was made by Nada from cloth woven by Romeo. 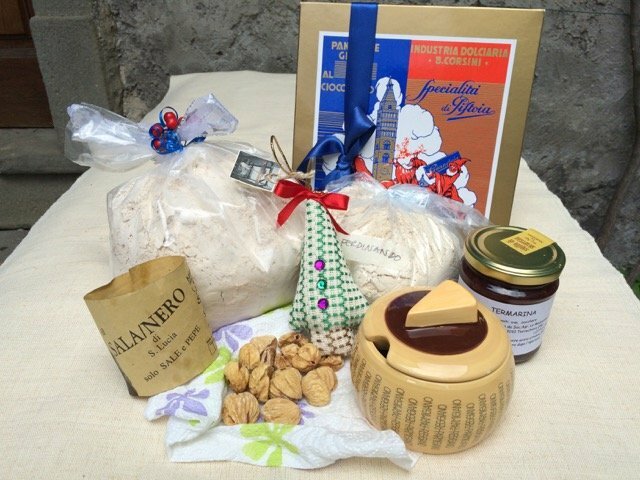 The parmesan cheese pot was a surprise gift from Signora Bernardi, a stallholder in the outdoor market at Fornoli where I buy mature pecorino and parmigiano. The jar labelled Termarina is jam made from an obscure grape variety from Parma. Paola Gorgatti of Agriturismo La Madonnina at Torrechiara presented it to me because the central heating was a bit sluggish the night I stayed. Termarina grapes are tiny and seedless. 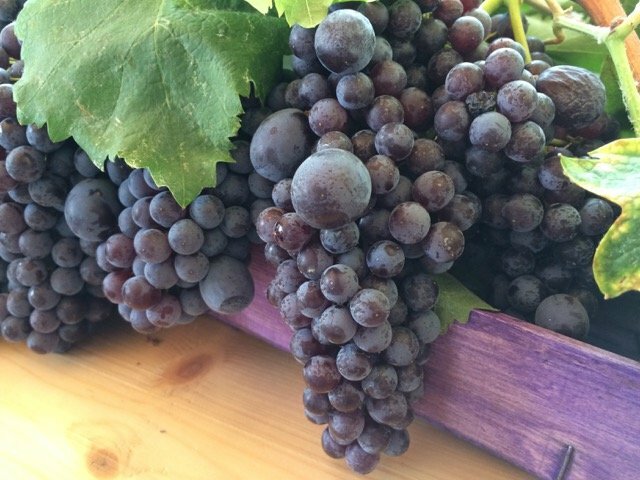 Each bunch has a few larger grapes which contain the seeds. The red and blue box at the back contains chocolate-covered panforte from Elisabetta and Maurizio: the ideal pairing with nocino. The reverse of the box boasts its provenance as a traditional artisan panforte from Pistoia, a rival of Siena. 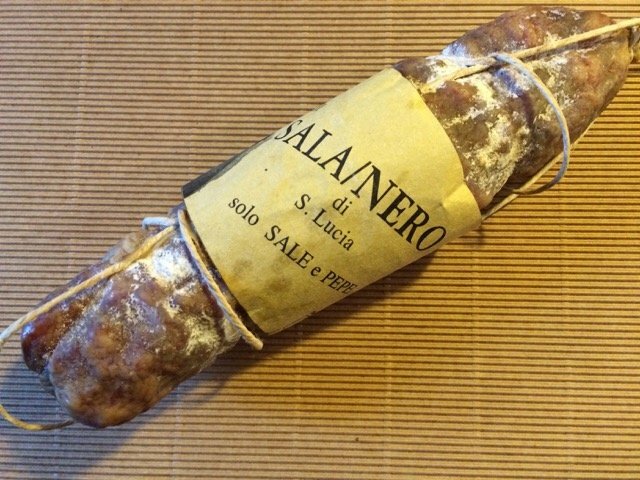 Oh, and that empty ring of paper on the left is all that’s left of the salami which was also a gift of Aldo Brianti. Utterly irresistible. I did get a photo of it before polishing it off. Overarching all is the generously blooming Iceberg rose. Rolando, who does the high altitude pruning for me, breaks all the rules for roses, yet they flower their hearts out for him. Already overwhelmed at the signs of generosity I’d gathered and photographed on my terrace, I went into the house and there on the stairs (my winter larder) I spotted the sack of potatoes presented to me by Riccardo and Amanda, my truffle hunter and his wife. Lowly potatoes they may be, but the lamb wouldn’t have been the same without them. 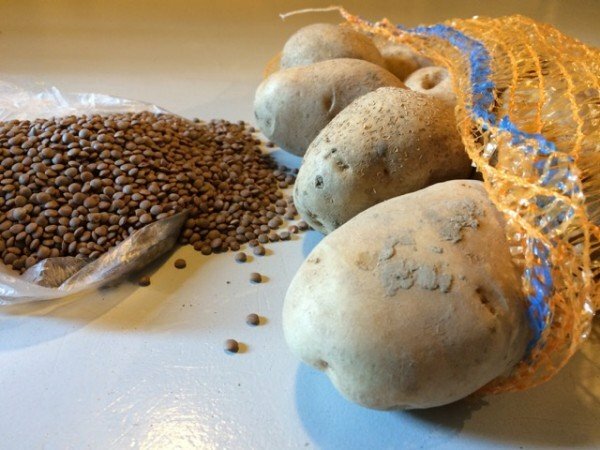 They’re from L’Aquila in Abruzzo, also home to four types of truffles and the tiny, tasty lentils of Santo Stefano di Sessanio, of which there was a bag hiding in with the potatoes. Lentils symbolise money, and it’s the custom to serve them on New Year’s Eve to ensure a prosperous year ahead. Join me in Italy and meet these wonderful generous people. Wishing everyone a year filled with generosity! 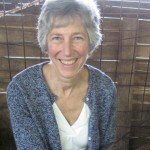 Erica Jarman invites you on inspiring culinary tours of life behind the scenes that you won't find in any guidebook — get to know the food artisans and craftspeople of Tuscany, Emilia-Romagna, Piedmont and Liguria. Come join me and my Italian friends and dip into a lifestyle where lunch is more important than business. Find out more at Sapori e Saperi Adventures and follow Erica’s own adventures on her blog. We really enjoy your blog. In your explorations of Modena, I hope you have had a chance to meet Davide at his Acetaia Villa San Donnino. We have visited him and his wife Christina in their historic property twice and have sent several friends there over the years. Their special and very delicious balsamico is produced in the traditional method and their hospitality and enthusiasm for their production is contagious. GRAZIE e felice anno nuovo!!! What a wonderful journey of the people you know though the lovely food and items they make and share with you. 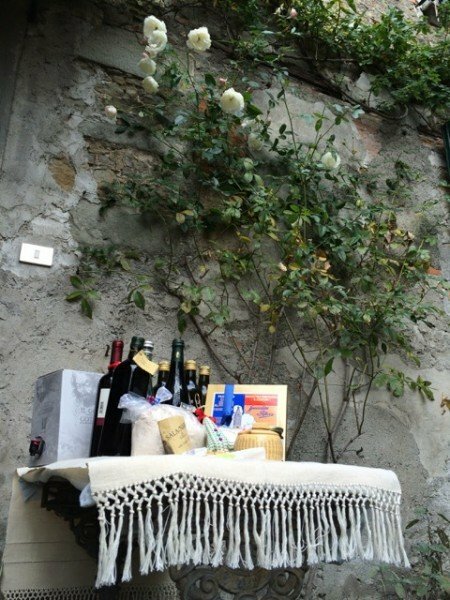 This really captures what is so special about your little area of Italy that you enjoy and share with others! I’m sure you recognised some of the people and already knew how kind and generous they are. Since I wrote the blog, I’ve been given some pork ribs by a farmer who rears the rare breed Mora Romagnola and a head of red radicchio by Eugenia (in the shop) because I was only buy green radicchio and she thought I should have a mixed colour salad. Fantastic! Laura, thanks for your recommendation. San Donnino is indeed on my list of acetaia to try. It’s one of the ones recommended by Benedetta of Salotto dell’Arti, a lovely 5-room B&B in Modena. Her brother works in a different acetaia, so another instance of generosity.